Getting your head down and concentrating on work can be tough when you’re constantly on the move. 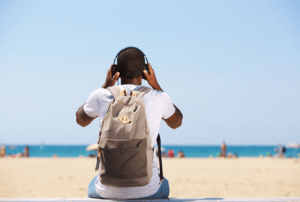 Noise-cancelling headphones are a great way to tune out background noise so that you can focus on a task, not to mention letting you get some rest when you’re on a flight to your next destination, which is sometimes a requirement as a digital nomad working on the go. 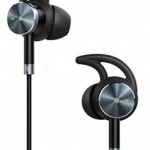 TaoTronics earbud headphones are perfect for digital nomads because they’re much smaller than most noise-cancelling headphones, making them easy to pop into your bag when you’re on the move. There’s a built-in microphone for all your Skype meetings, and 15 hours of continuous audio means you won’t run out of battery halfway through. There’s a remote control so you can adjust the volume and pause or skip music tracks, and special hooks mean they’ll stay in place even when you’re out for a run. At an affordable $45.99, they’re budget-friendly, too. 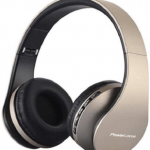 PowerLocus over-ear headphones are bulkier than the ear-bud style headphones, but they fold away into a convenient free carry case for easy transport. Noise-cancelling technology and high sound quality mean these headphones do a great job of playing your tunes and podcasts. Thanks to Bluetooth capability and a removable cable, you can choose to use them wirelessly – ideal for hands-free communication. There’s a 12-month warranty, and they’re stretchable for the perfect fit. They cost $23.99, so they won’t take much out of your beer budget, and they come in a choice of colours. 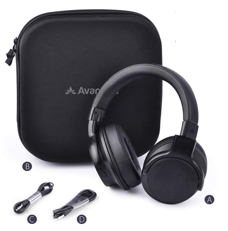 Avantree wireless headphones claim to reduce background noise by up to 80%, helping you focus on your work while you’re in a noisy cafe environment. A two-in-one Bluetooth wireless and wired design makes this a versatile choice with superior sound quality, giving you an impressive playback time of 28 hours. They’re also ideal for making and receiving phone and Skype calls thanks to built-in controls that let you adjust the volume, answer calls, mute the microphone and more. They don’t fold away, but they do come in a handy travel case to keep them safe in your bag. They’re pricier than others on this list, at $69.99, but they come with a two-year warranty. At $94.99, these noise-cancelling Bluetooth headphones may be the priciest entry on this list, but they’re arguably also the most stylish. Available in a choice of colours, they’re a striking as well as practical accessory capable of crisp sound production and high-quality phone calls, even though they’re wireless. 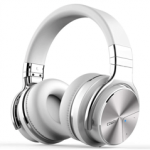 They’re also incredibly comfortable thanks to soft ear pads, and even better, they have a 30-hour battery life and 18-month warranty. They come with a hard case to protect them from getting damaged when they’re in your bag. If you’re in the process of getting kitted out in preparation for location independent, digital nomad life, traveling the work while working, you might also like to have a read of our posts on the best backpacks and the top mobile hotspots for digital nomads.